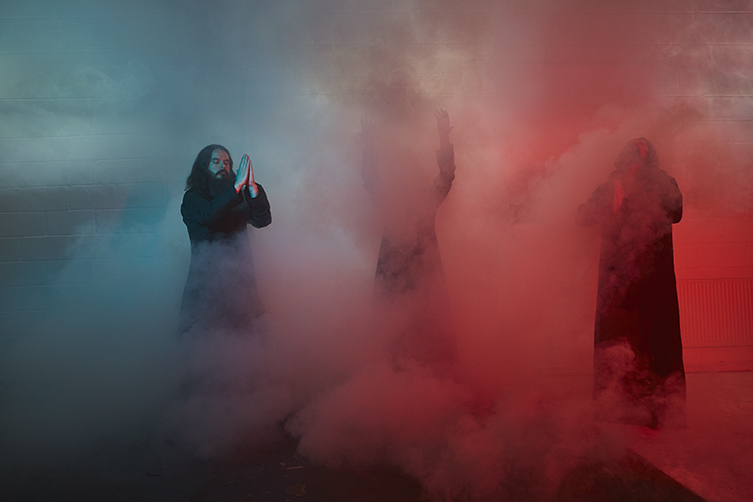 Dressed in robes and brandishing extreme volume levels as if colours on a painter's palette, Seattle's Sunn O))) are a singular voice in the wide and varied world of modern experimental music. Their sound is monolithic, textural, intense and cathartic. Mountain top-striding distorted guitars entwine and mix to create a dense and seemingly inpenetrable wall of extreme sound. There are no drums to speak of and only occasionally are there other instruments like synths, brass and vocals. Sunn O))) are almost the definition of 'uncompromising'. 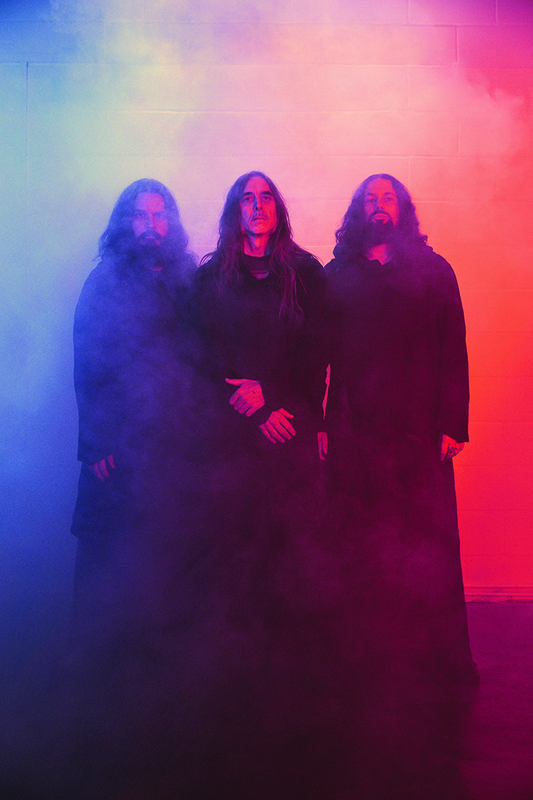 To those unused to their universe, Sunn O)))'s music can be stark, alienating and difficult. 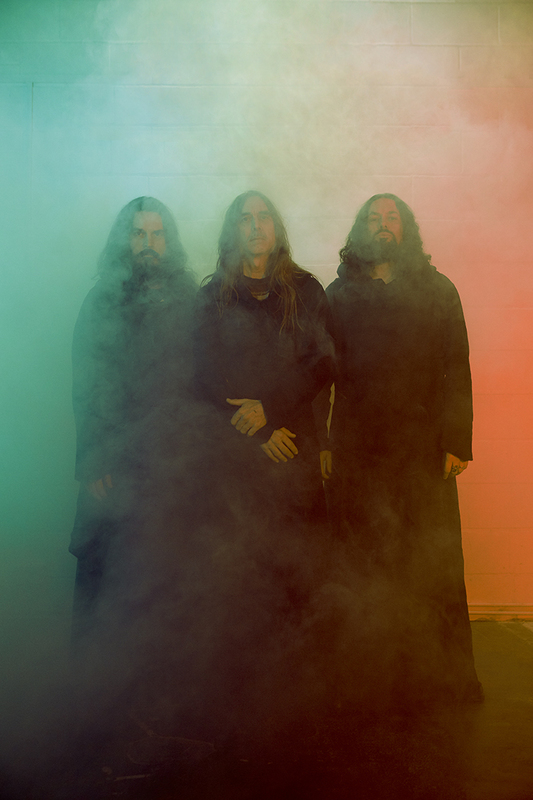 To their ever-growing legion of fans, though, listening to Sunn O))) means taking part in the listening experience, getting inside those swirling and often subterrenean frequencies to find sublte and eloquent harmonic relationships within the distortion. Layers of sonic information decode through the audience's ears to give Sunn O)))'s music its emotional kick. Their famous live volume levels are no mere gimmick, either: indeed, it is this very balance of harmonic information, overtones and sympathetic sound brought out by the exceptional volume that helps to create the very detail and texture that their audience loves. Sunn O))) are, for the main part, a two piece, made up of members Stephen O'Malley and Greg Anderson. Together, they have recorded 8 albums, including the forthcoming Life Metal, with another record, entitled Pyroclasts, on its way this year too! Currently preparing to tour in support of Life Metal, Stephen O'Malley agreed to speak with Ray in a candid and very illuminating interview. Naturally, Ray leapt at the oportunity to find out more about what makes this mysterious creator tick. Read on to find out a lot more in this very open and specific interview. Stephen, thank you so much for talking with us! Sunn O))) have a new album out very soon and we’ll get to that but first, let’s start a little further back. What was the original intention for Sunn O))) when you started out back in 1998? The intention was Greg and I playing guitar together again. We had done a few projects together before and there was a gap of a couple of years when we weren’t playing together, mainly because of geography. We both ended up in LA and starting playing again, and that was the seed that became Sunn O))). You wear hooded cloaks on stage and have lots of dry ice effects. Is there something ritualistic about a Sunn O))) live performance? Actually, they are robes - designed by Alexandra Groover - and it’s not dry ice. We are using fog machines from Smoke & Fog Factory in Germany,. I think anyone who witnesses or participates in a Sunn O))) concert can attest to the pseudo-ceremonial aspect but its an aspect which I don't find limited to those trappings you mention. Rather, it’s arising from the nature of what a performance can be and where these traditions arise. That, and what Sunn O)))’s music does, as far as the audience participation of the performance as well. It’s a psychosocial gathering that our audiences are really a part of, inside of. I understand, there are a lot of elements being brought together. What about musical influences? I’m assuming you were into grunge and metal growing up, would that be correct? Those are two styles of music that we are both very much fans of at one time or another, today too, but they are also quite big umbrellas over very diverse musical styles. Hundreds of varieties - we are long haired guys from Seattle…haha! Haha, indeed! What artists inspire you today? I’m most inspired by artists whom I’m personal friends with. Mainly by their vision and work ethics. Without naming names I think that with people who are really working towards these visions truly as more or less fundamental parts to their lives, it’s hard not to be inspired by that. I’m grateful to have many artist friends, and music friends, composers, film makers, writers and other creative minds. I feel like I'm just barely touching the tip of the iceberg of what’s possible considering what a lot of people are capable of achieving with their work so it’s pretty easy for me to be inspired and motivated by such gifted people. That's an amazing attitude. Moving back to your music, would you say that context is important when listening to or thinking about Sunn O)))? 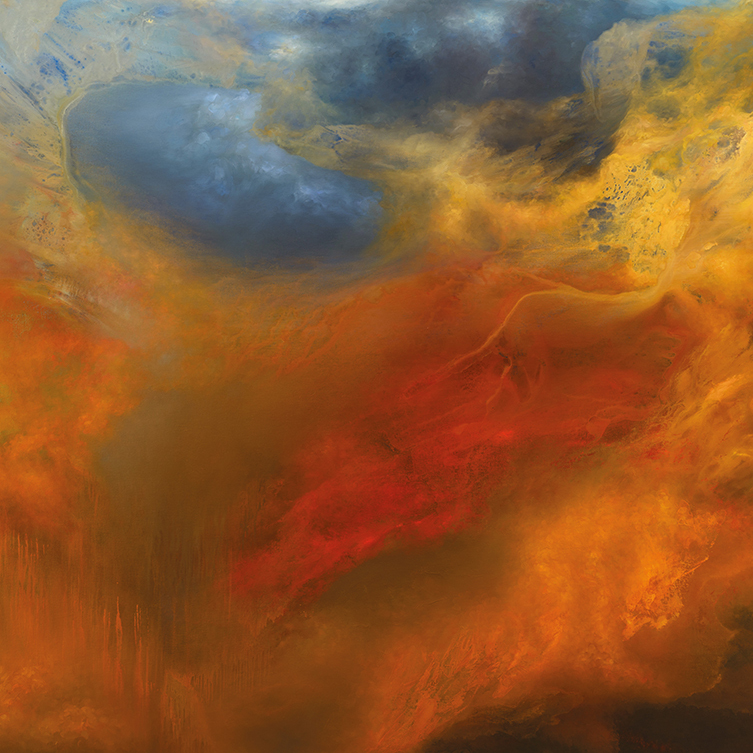 Sunn O))) is essentially a kind of abstract music project/art project. So we are dealing with art, music, sound and abstraction, and I find that anything I verbalise about Sunn’s music is essentially abstraction as well. Because it’s a completely different language which involves a set of vocabulary which can frame abstraction in a certain way. One topic which I have been discussing in the Life Metal-related interviews is that it’s very interesting the role of how language can be incorporated with Sunn O)))’s seemingly abstract and minimal form and the way language itself frames it in a way that retains very subjective interpretations. Individuals will choose to use all sorts of different terminology to describe what they’re experiencing and I find that to be very interesting, because it might be a very different terminology or vocabulary than I would use myself or someone else would use to share the same elemental experience. The fact that people are reaching to describe an experience is, I think, the important part. Given the nature of your music, how does the writing process begin and develop? With Life Metal the process of writing or composing began in a very similar way to our first demo or any of music that Greg and I have made together. It’s quite basic really, and just involves Greg and I in a room with our guitars and our amps, coming up with parts and sharing riff ideas essentially. The way those ideas are able to develop from when we walk out of that room and the processes of possible paths of development as well have changed tremendously over the years, based on the individual and collective experiences we've had with this project, the resources we have gathered and the opportunities we've had as artists. We have been able to really stretch it quite far in different directions based on all of that. Do you choose instruments for their harmonic overtones or feedback abilities? Yes! The answer is Yes! Hahaha! Sunn O))) are famous for the volume of live performances. Has this ever been a problem for venues? And do you use specific ear protection? It can be a technical challenge for sure, but we have an awesome professional experienced technical crew who meet all of those challenges in a way that allows us to present the full intention without compromise. And yes, we all use ear protection! Most musicians doing amplified music should do that if they want to continue making music into middle age - most of us have made it to middle age without going deaf so that's a good sign! This isn’t masochistic. What does volume give you? Volume is energy. It’s amplitude of wave form. It gives energy to the environment, sound energy. Can experimenting with frequencies and oscillations be as musical as using tones, melodies, harmonies and counterpoint? Yes, these are the same subjects just using a different vernacular. Tone is timbre, pitch amplitude, melody is perceptual decision based on cultural code as is harmony. Your song 'Alice' from the album Monoliths & Dimensions has a lot of deep brass sounds. Is this one step on from the extremity of Sunn O)))’s electric guitars? Would you say that brass instruments are perhaps the heaviest sounds out there? There are trombone and tuba players on that piece. Our intention was to use low brass for accompaniment approaching the timbre of the electric guitars. At the end of that piece there aren’t any electric guitars. Alice is experimenting with the concept of spectralism in some ways, a compositional style which utilizes transformation of the memory of timbre for different instruments into others. That's really interesting. That reminds me of another famous records of yours. 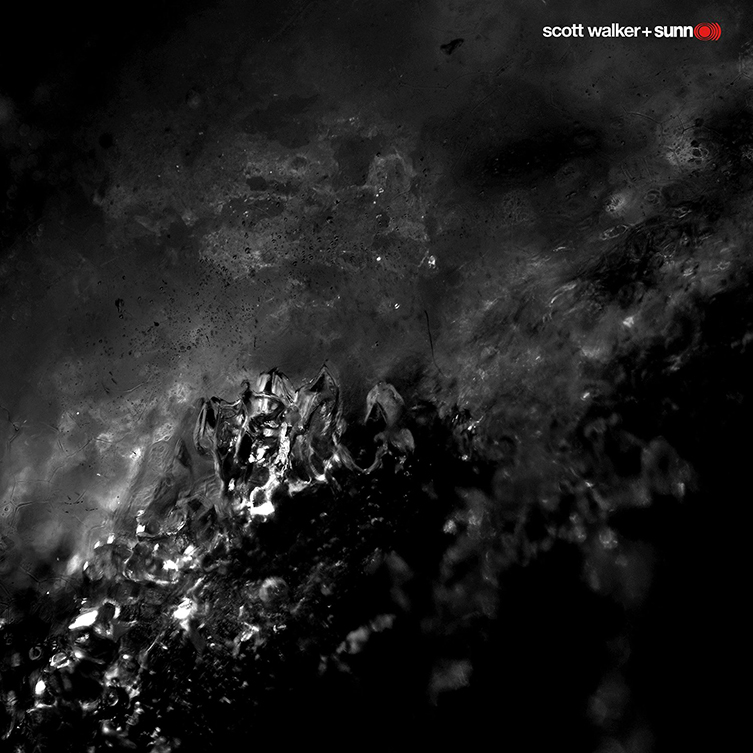 You collaborated with the legendary Scott Walker for the album Soused. Was there a relationship in place before you worked together? And were you a fan of his music anyway? The songs were fully scored and the collaboration in many ways was Sunn O))) replacing the role Scott historically gave to the ensemble. It was definitely performance based on our character: I must state that Scott has a deep understanding of our approach and sound. I experienced it as a tremendously educational moment and opportunity, in one way because I could understand truly as a spectralist point of view that Sunn O))) could be a stand-in for an orchestra, and the relationships our music may have with those traditional ensembles. Sunn O))) did work on some of the arrangements with Scott and also some of the meter and rhythm, and obviously tones and timbre. Let’s talk a little about guitars. I’ve seen images of you using Les Pauls with both humbuckers and P90s: are these still your main guitars of choice? Greg Anderson plays 2005 Les Paul Deluxe Gold Top w/ Black Dimarzio Super Distortion P-90s. I play Travis Bean guitars and also EGC500 & DS Ghost with P90s, but most of my guitars have stock humbuckers. What makes a good Sunn O))) guitar? Well, we like those guitars, those are iconic instruments: I think they speak for themselves. Their legacies are both very deep. You both use low tunings. How low do the tunings go? And what gauge of strings do you use? It’s essentially a baritone tuning on a standard guitar neck with a drop A. I have a 68-74 on the bottom, Greg is working with a 54 on the bottom. I often use flatwound strings and Greg is using regular wound strings. Your band’s name comes from the amplifier brand. Do you still use Sunn amps to record and tour with? What else makes up that intimidating wall of backline? Of course. Our band is named after the amplifier which is truly at the core of our music. We use Sunn Model Ts, they are the center of the backline for the guitar both live and on album. We also use a lot of different amps in the studio for the specific timbre but live it’s 3 or 4 Sunn model T stacks and 1 or 2 vintage Ampeg SVT stacks each per guitar player then the other instruments may have different types of amplifiers: vintage Ampeg, Hiwatt and Fender. So, the new album, Life Metal. The title is brilliant! Is this a response to the rise in popularity of Death and Black Metal? No, it’s not in a response in the rise in popularity of Death and Black Metal. I am personally a lifelong fan of Death Metal since I was about 12 years old so I am not responding to it in a contrarian way. I think the title has more to do with a philosophical approach of having a group that's been solid in progressing and growing artistically and as an artistic constellation for 20 years. I see. Talking of extreme Metal, Mayhem’s Attila Csihar performs lots of vocals for Sunn O))), both in the studio and on tour. How does he contribute to Sunn O)))’s message? Yes, Attila’s unique and idiosyncratic charisma is very much a part of Sunn in a deep deep way, he’s a terrific human and an immensely talented singer and artist, a much loved and admired friend and brother. The record was produced by the legendary Steve Albini. How did you find the process of working with him? Did you come away from the process with any fresh insights? Indeed. Steve’s method of working was on one hand what you might call old school, because he’s working on tape and he’s working an analogue desk. It was liberating because we were able to make executional decisions about the work in a really clean way. It helped us to be very confident in making important artistic decisions with immediacy. The method pushed us to give more with the performances that were being recorded. That’s not exactly new information for us, but it was a really enriching, enjoyable and positive experience to work with Steve and have him record a Sunn O))) album. Is the fully analog recording situation an important part of the process for you guys? Well with Steve he’s recording on tape and mixing to tape, so it was on this album. In general we're not the kind of band that is dogmatic about how we work in the studio. We are more about getting things down with the resources we have to try and reach the ambitions we have. We've been lucky to be able to work with great engineers and also with tape on many albums, but until Life Metal we have never done the entire process on tape. It’s often been used as a step in the recording for tracking to give the tape compression colour but then moving to Pro Tools for the majority of editing, mixing and often with an analog board. There’s obviously some romanticism and idealism to talking about analogue. But the thing is, as far as the term 'analogue recording' goes, it’s a bit of a fantasy and not exactly true - ever - because you still have digital segments in line, you still have basically a combination of circuit paths for the guitars. And with us sometimes there's some outboard gear used, but the majority of the production is done on tape. And that’s the difference. When you state AAA for an album; Analog recorded, Analog mixed and Analog mastered, they all have specific guidelines. I mean is …. it is still analog when you have people in the control room on their phones looking up lyrics or whatever… But with Steve it’s tape recordings. Outside of Sunn O))), you are also an artist. How do you juggle these various creative disciplines? Do you focus on different things at different times of the year? It seems to me that at this point of time I am a musician, an artist and a composer. That’s just what I do. It’s all part of the big picture in my lifestyle. I am not clocking in or out of anything - I am very fortunate to be occupied with all of these kinds of works and have the opportunities and feel really blessed by that. It’s hard for me to take time, one thing I like to try and occupy myself in during the spring and summer months is being out in the mountains and away from any of these things in order to reconnect. It's a great way to be, and very inspiring. Is Life Metal a good starting point for someone who has not heard Sunn O)))? Maybe it is. I haven’t been asked this before. I think it could be, the music is very honest as far as where were coming from as a concept. It embodies a wide palette of colour and texture and harmony that we work with both live but also through the arc of the band and through many of the other things we have done on recordings. I think it’s a great record. We’re really behind it artistically. Of all of our records this one has the most positive ambition from everyone who’s worked on it in some way - not to say that the other albums did not - but that aspect comes across a bit stronger on Life Metal. Perhaps it’s just because it’s present right now. It feels real and true. Not as discordant with the live aspect, or of people involved in different respects. Yes maybe it is a good starting point. It just sounds great! And finally, do you think of yourself more as a composer or a guitarist? A composing guitar player… to be honest, I have a lot of trouble writing on guitar, and it’s not something I do very often actually, I love playing guitar and I love playing the compositions Sunn has made on guitar, and the work of other composers I work with. And to improvise live. But I don't really sit down and write on the instrument very often, but I do write a lot of music. I might use the guitar a kind of voltage generator, I might use synth or other instruments or write for other instruments or write abstractly with a pen. Or with collage or montage. But I am not often writing on guitar, I am definitely not a well versed composer with conservatory education either, not a very technically proficient guitarist, but I certainly love and enjoy playing the instruments. Fantastic, thank you very much indeed for talking to us, Stephen! Life Metal by Sunn O))) is released by Southern Lord Records on 26th April 2019. Keep up with Sunn O))) here. We would like to thank Stephen for not only his time but also his gracious answers. We'd also like to thank Lauren Barley and her good people for their invaluable assistance in making this interview happen. 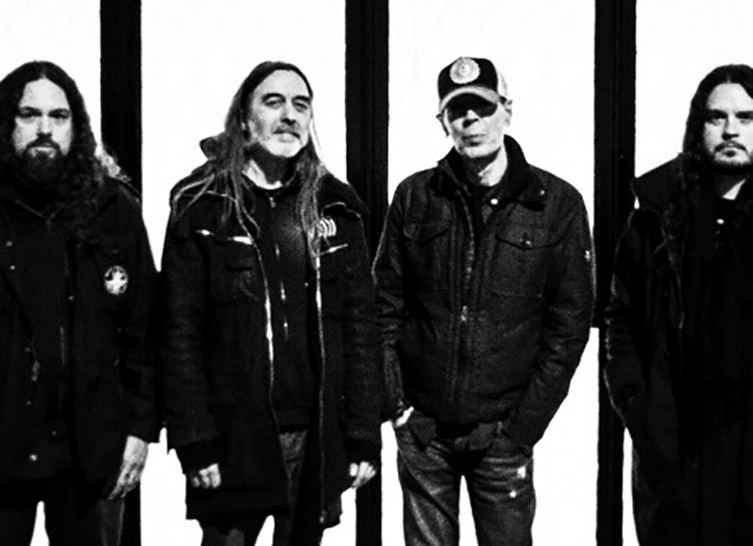 Finally, as we mentioned earlier, we would like to humbly dedicate this article to the genuinely legendary singer, songwriter, visionary and of course Sunn O))) collaborator, Noel Scott Engel, otherwise known as Scott Walker (1943-2019). Thank you for the music and the inspiration.